The Ponte Vecchio in Florence is one of the most famous tourist spots in Italy, and is thought to be the oldest wholly-stone built, segmental arch bridge in Europe, although there are many partial segments which date further back. It was originally built of wood until destroyed by floods in 1333, and twelve years later it was rebuilt using stone. Famous for its lining of shops, the bridge has housed everybody from Medieval merchants and butchers to souvenir stalls and art dealers. The Magdeburg Water Bridge connects the former East and West Germany over the Elbe River, and it was made as part of the unification project. 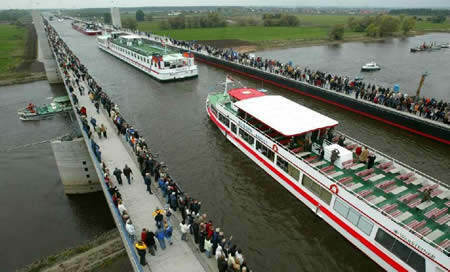 1 km long, the 500 million euros water bridge enables river barges to avoid a lengthy and sometimes unreliable passage along the Elbe. Completed in 1894 and designed by Horace Jones and Wolfe Barry, Tower Bridge (so named after the two, striking, 141-ft high towers and the Tower of London close to it) is one of the most famous landmarks in London and one of the most beautiful in the world. The 800-ft long bridge has a 28-ft clearance when closed but raises in the centre to a maximum clearance of 140-ft that allows ships to pass down the Thames. Back in the days when goods were moved by sea instead of air the bridge was raised around 50 times daily. Tower Bridge took 432 workers 8 years to build. During that time they sank 70,000 tonnes of concrete into 2 huge piers, lowered 2 counterbalanced bascules into place each weighing 1,000 tonnes and then clad the whole bridge in Portland stone and Cornish granite to disguise the 11,000 tonnes of steel beneath. The Wind and Rain Bridge is the symbolized architecture of the Dong minority people. The wind and rain bridge in Diping is the largest of its kind in Guizhou Province, where China's biggest Dong community lives. The bridge is over 50 meters long and it was first built in 1894 during the Qing Dynasty over 100 years ago. However, the original structure was destroyed in a big fire in 1959 and the one visitors see today was a recreation finished in 1964. The Octavio Frias de Oliveira Bridge over the Pinheiros River in São Paulo, Brazil was opened in May 2008. It is 138 metres (450-ft) tall, and connects Marginal Pinheiros to Jornalista Roberto Marinho Avenue. Its design is unique in that the 2 curved decks of the bridge cross each other through its X-shaped supporting tower. Designed by Heatherwick Studio, the award-winning Rolling Bridge is located Paddington Basin, London. Rather than a conventional opening bridge mechanism, consisting of a single rigid element that lifts to let boats pass, the Rolling Bridge gets out of the way by curling up until its two ends touch. While in its horizontal position, the bridge is a normal, inconspicuous steel and timber footbridge; fully open, it forms a circle on one bank of the water that bears little resemblance to its former self. At a height of 36 metres or 12 storeys from the road, it is the highest pedestrian bridge in Singapore. The 300-metre bridge links up the parks at Mount Faber and Telok Blangah Hill. Towering 1,125-ft above the Tarn Valley in southern France, driving along the Millau Bridge is said to feel like flying. This Foster + Partners marvel is slightly taller than the Eiffel Tower, took three years to build and opened to the public in 2004. While it may provide picturesque views of the valley below, once the mist descends it is not a route for the faint hearted! The Millau Bridge has a total length of 8,071-ft with the longest single span at 1,122-ft and a maximum clearance below of 886-ft; in short the bridge is massively impressive both on paper and in real life. The deck is lofted on 7 pylons and weighs 36,000 tonnes. A series of 7 masts, each 292-ft tall and weighing 700 tonnes, are attached to the corresponding pylons. On September 9, 2008, the Banpo Bridge in Seoul (South Korea) got a major facelift: a 10,000-nozzle fountain that runs all the way on both sides. Immediately after being installed, the bridge turned into a major tourist attraction, as the bridge pumps out 190 tons of water per minute using the water from the river below. Anyone want to add on this list?